It's that time of year again. 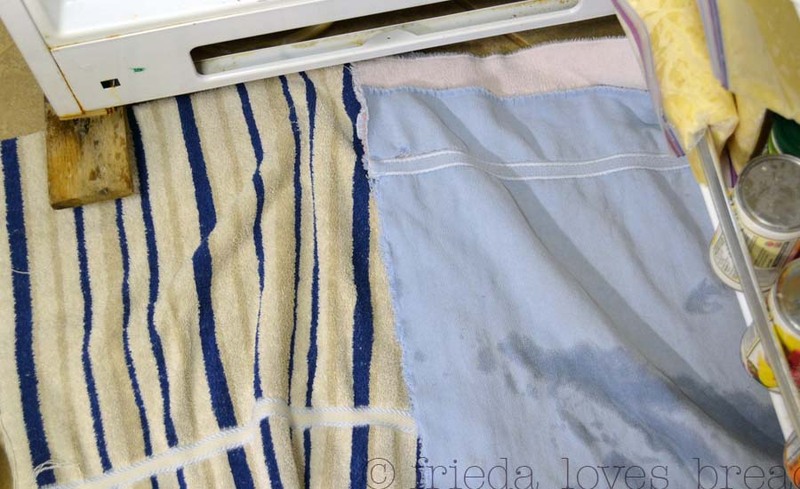 You know how you feel the "need" to clean in the Fall and in the Spring? Well I have that at the end of the year. Time to put away the Christmas decorations, go through all my files, and yes, clean the freezer. When I told hubby that I was not looking forward to this task, he asked, "Why not get a frost-free freezer?" This is why: your frozen foods will stay fresher and you can freeze them for longer. 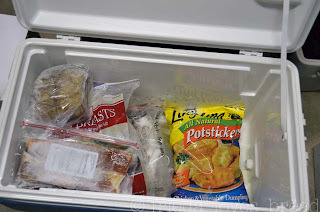 A frost-free freezer wicks a lot of the moisture from your frozen foods and shortens its shelf life. 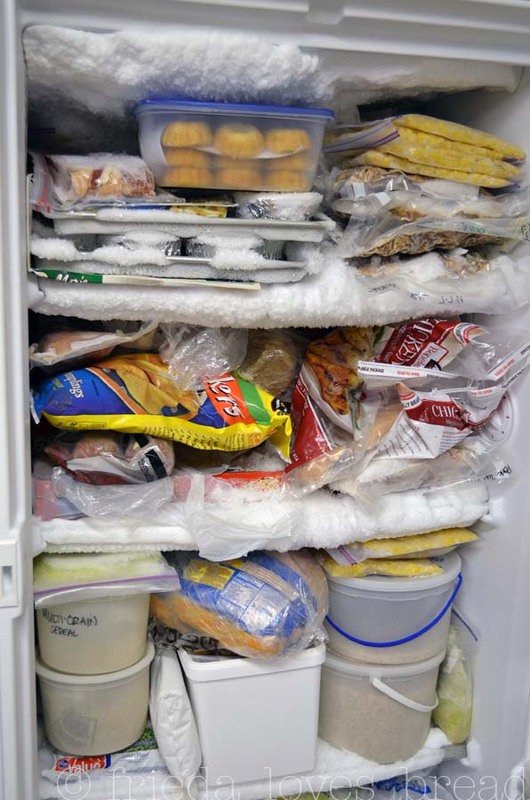 Use a FoodSaver, and your frozen items will last up to two years in a standard freezer. What I thought would take all day, really only took 2.5 hours. Here is my before shot. At the top left hand of the freezer is a HUGE frost chunk. Wanna know why it's there? I have a seal leak ~ frost builds up anywhere where air can reach your freezer. 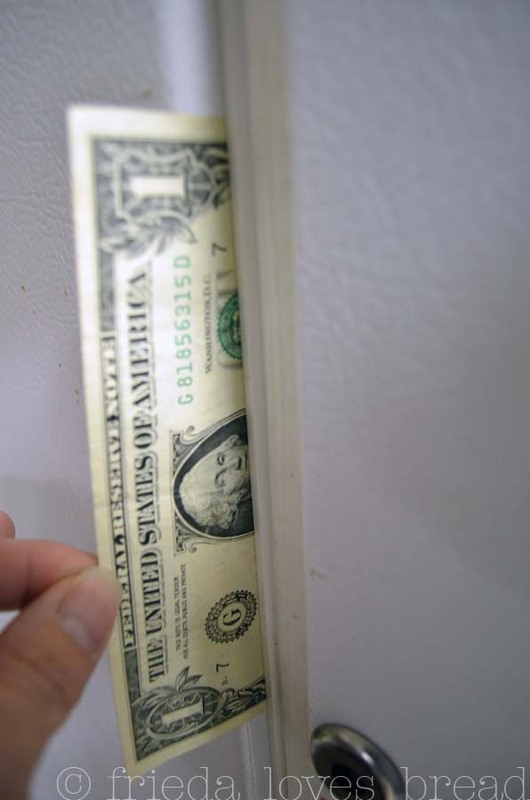 You can check to see if you have any leaks by feeling for air along the seal, or give it the dollar bill test: Stick a dollar bill between the door and the seal. Close the door. Tug on the bill; if it comes out easily, you've got a leak. My freezer seal appeared to be in good shape; no cracks or breaks. As to why I was getting an air leak in the top left hand side, it was probably because my freezer door was not "square." 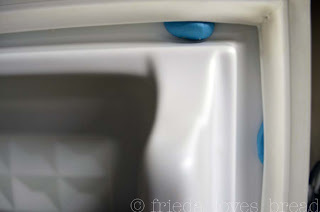 It is also possible that this is where people "open" the freezer door, as my freezer does not have a handle. I could have unscrewed the hinges and squared the door, but I opted to use a quicker, faster, easier method: Fun-Tak. This is the stuff my teen uses to hang posters and other objects on his bedroom wall. After cleaning my freezer, this is what I did to help the door seal. It worked! Gloves. Ski gloves work great! Coolers or bath towel lined cardboard boxes for your frozen goods. Bowls filled with boiling water (use your gloves!) You can also fill large stock pots with boiling water. Close the freezer door and let the steam melt the frost. Change the water when it becomes room temperature. Plastic or wooden spatula to scrape off frost. 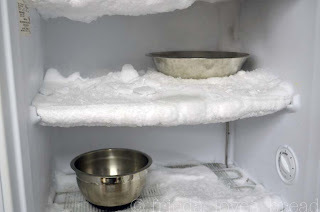 Do not use metal as you can take off the protective finish off some surfaces of your freezer. Remember to unplug the drain and put the drain hose in a pan or bucket. 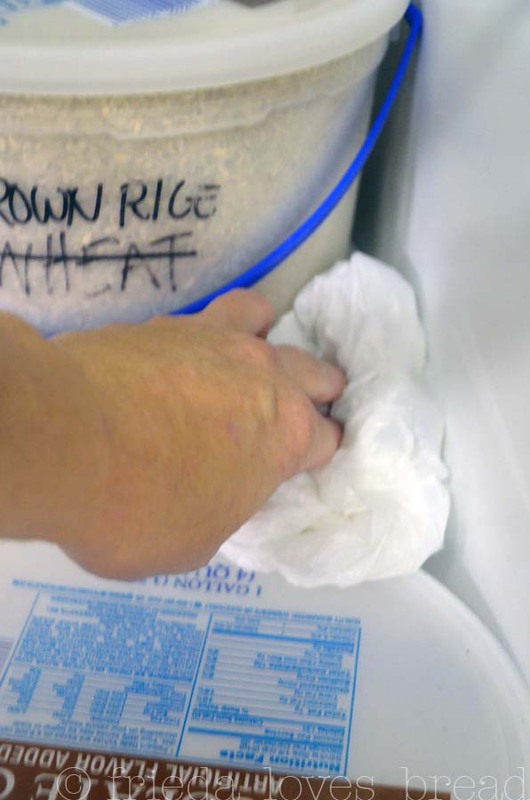 Want some secrets to keeping your freezer *mostly* frost free? Use square packaging. 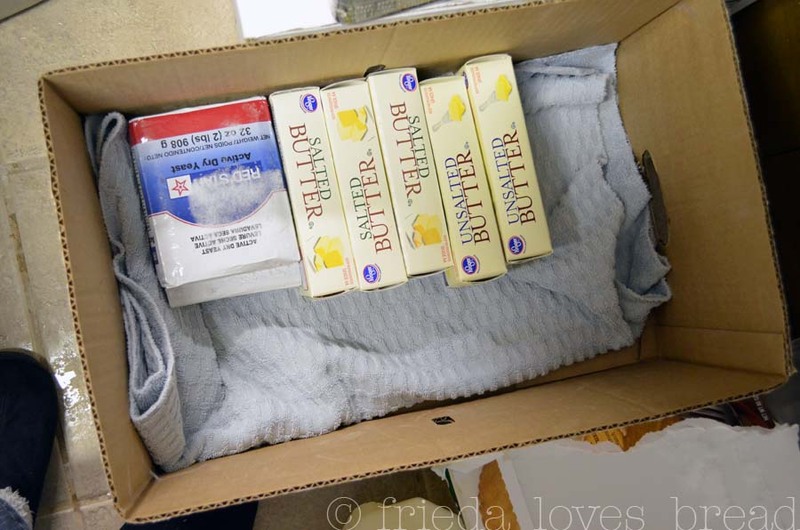 Boxes, milk boxes are great and acts as "drawers" in your freezer. See all those *dead* spaces of air that can create frost? Plug them with shopping bags. The more you can keep your freezer FULL, the more slowly frost will develop. I love my freezer! I was able to take inventory of everything, and throw out anything that had major frost bite. I organized it with meats on the top shelf, veggies and grains on the next shelf, fruits and cheeses on the bottom shelf. Thank you for inspiring me to do this and for including such great step-by-step instructions. 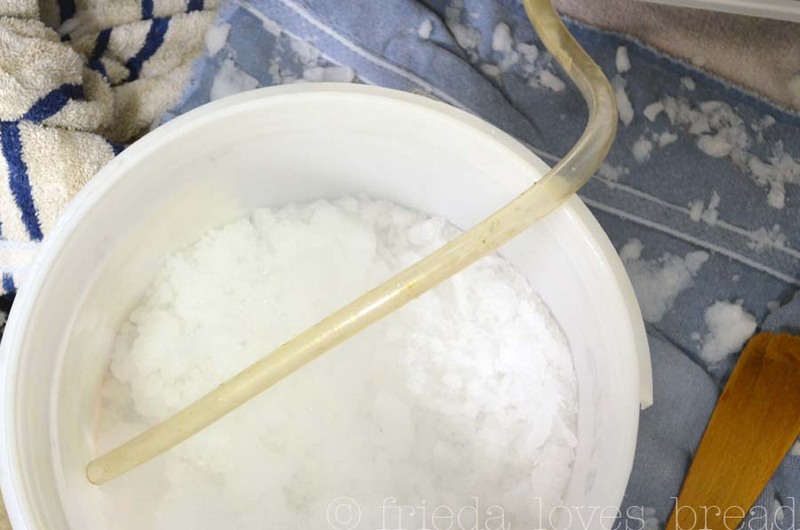 I've never defrosted a freezer and both my kitchen and garage deep freezers need it badly. Great tips and loads of inspiration! 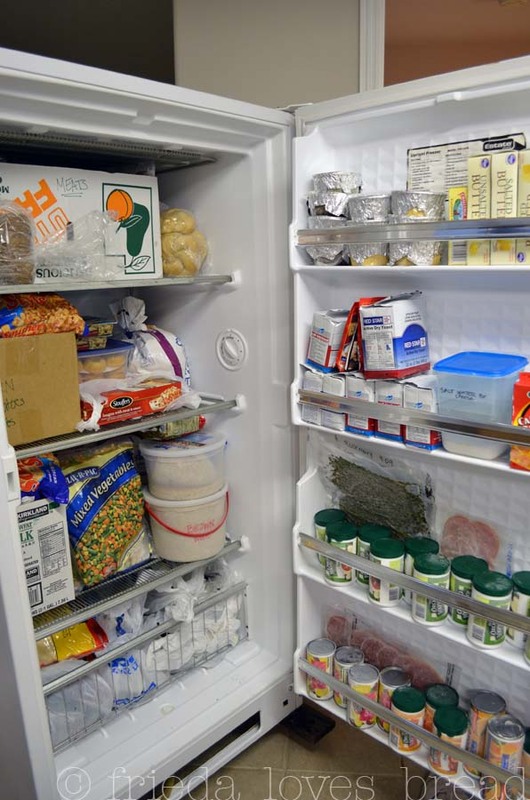 I love to go and open the door thousand times after I´ve cleaned my fridge and freezer, and everything is so clean and tidy. 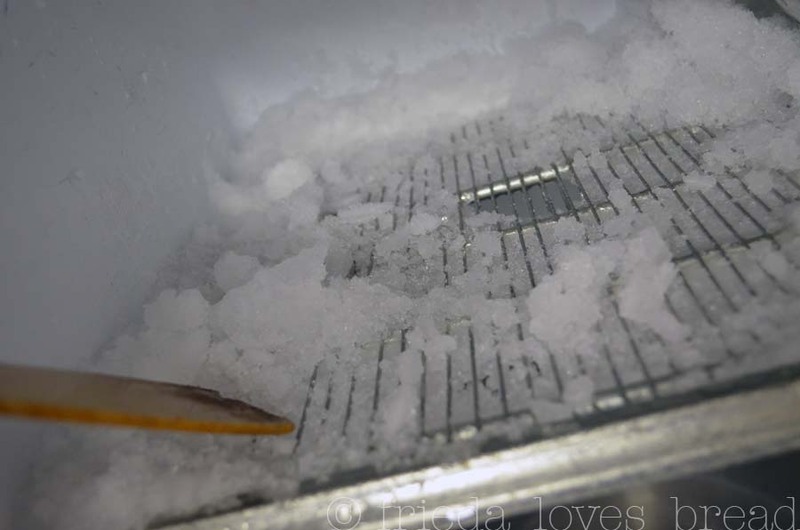 Reminds me of my college years and defrosting the freezer at the end of every year. I need to go see how much frost there is in my chest freezer now! 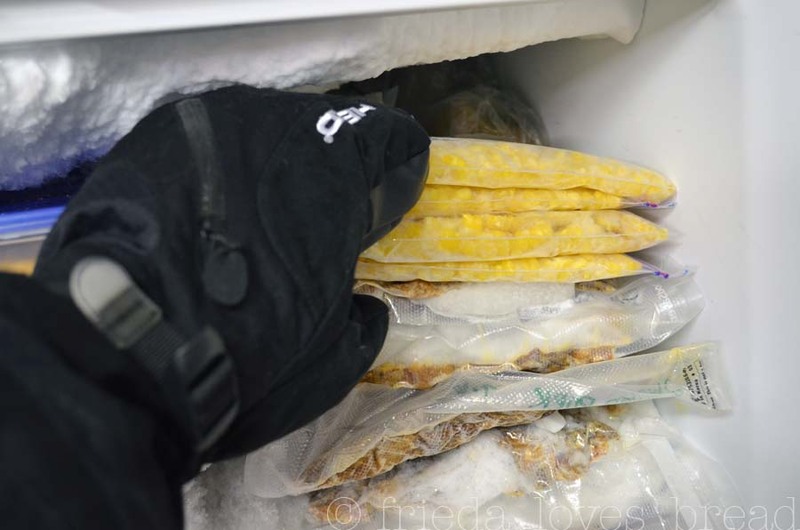 That's one heck of a freezer you've got there! 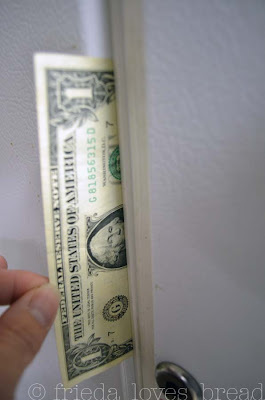 I'm going to have to try the dollar trick because the fridge/freezer unit in my rental looks like the Arctic tundra! Thanks for the inspiration! That's a job everybody hates, right? Luckily my three still look fine, but thanks for all your tips.I'll give you a call when mine are due and you can come ever. I think you are the pro now. You and I must have been sisters in a previous life! Besides our bread-baking expedition, we think alike! We moved to our new apartment during the holidays, and I had to defrost the freezer in the beginning of January, writing the inventory down on an dry-erase board. 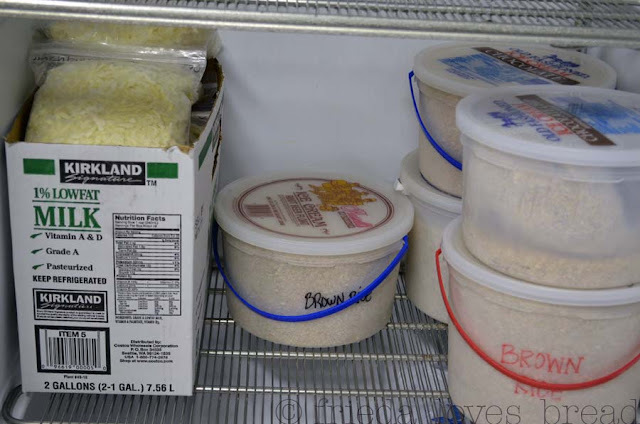 And, surprise, surprise, there are three cardboard boxes in our (box) freezer - love its new, clean, and organized look!